The virtual machine \"%1\" is not available anymore. The virtual machine \"%1\" is not available (%2). The virtual machine is not available. The virtual machine's files have been moved or deleted. If the files are on an external device, reconnect the device. You can also remove the virtual machine from the list or manually locate its files. Virtual machine .pvm file was moved from its original location. Virtual machine .pvm file was removed from Mac. If the .pvm file is not there, think of the operations your performed on your Mac recently that could cause it to disappear from that location. If you find the needed .pvm file, place it back to the above mentioned folder. 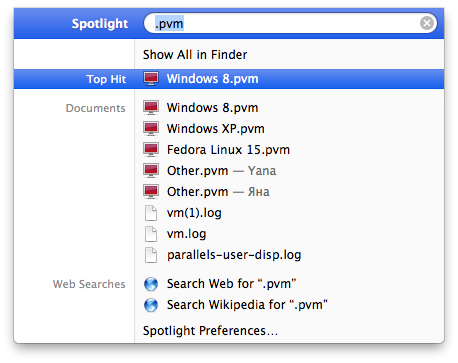 You may also search for ".pvm" file using Spotlight. 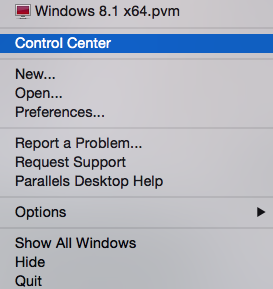 By default, Parallels Desktop stores virtual machines in /Users/<username>/Documents/Parallels folder. 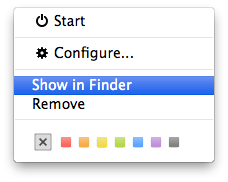 In new Finder window look for your Virtual Machine .pvm file. If the .pvm file is present in the folder where Parallels Desktop searches for it, make sure its permissions are correct. NOTE: If the .pvm file of a virtual machine is nowhere to be found, the only solution would be to start from scratch. There is no way to recover .pvm file if it was lost unless you have a backup. Refer to this article for instructions on how to install Windows in a new virtual machine.